« Olmsted Park—From Malarial Swamp to Popular Green Space. I’m getting antsy. I’m trying to get two of my own novels ready to put up on Kindle and to also produce paperback copies of each on Amazon’s Create Space, or whatever they call it. So, to relax, I take drives with Chloe (my Canon 5D Mark III camera) and my Canon EF 70-200mm f/2.8 L IS II USM lens. A few hours ago, I also asked my friend, Christine Mack, to go with us. Christine likes Chloe, but Chloe’s not so sure about Christine. 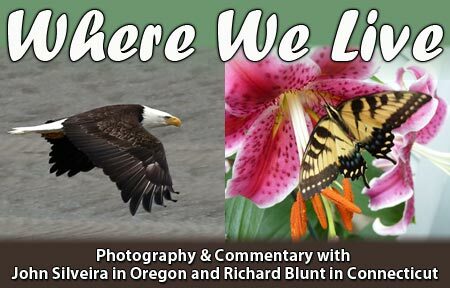 Somehow, the drive took us up Jerry’s Flat Road, leading inland out of Gold Beach, Oregon, on the south bank of the Rogue River. When we reached Lobster Creek, we pulled into the campground and drove down to the boat launch ramp. I was surprised the heron hadn’t already flown away because there was a boat at the end of the ramp with three people in it. But I caught on quickly: They were fishermen and they were cleaning and fileting their catch and they were feeding the scraps to the birds that had flocked around. This included the heron. By the time Christine and I were getting down to the the water, the heron was walking away along the shoreline. That’s why I couldn’t get better photos of it. 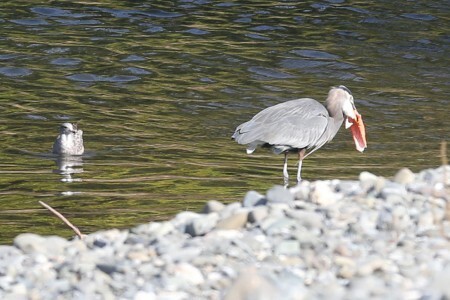 And, because they are inherently skittish and it already had its piece of fish in its beak (that the salmon-colored thing hanging out of its mouth), it flew across the Rogue to get away from us. But, not before I got some photos. All of these were cropped for the blog. 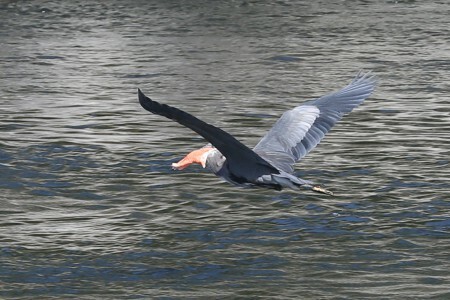 This was the first of the photos I took of the heron. He (she?) had already gotten the handout from the fishermen and was walking away. That’s just a big piece of fish in its mouth. Still walking away with his fish scrap. I’d actually looked down at the camera to check my previous shot when the bird started flying across the river, so I missed its takeoff. 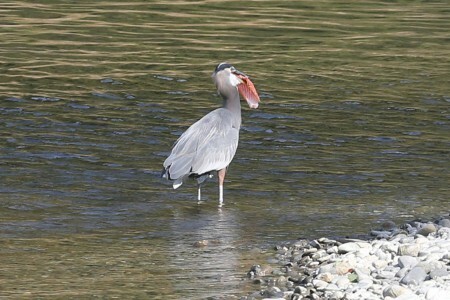 Until then, I had been wondering if it was going to fly with such a large piece of fish in its mouth, and here was the answer. 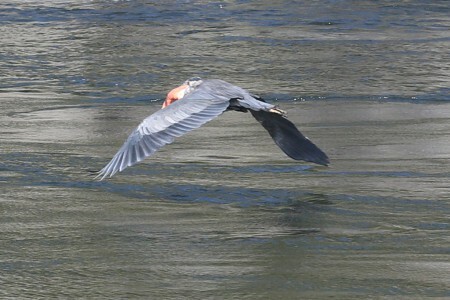 And here it was landing on the north side of the river, still carrying its fish scrap. 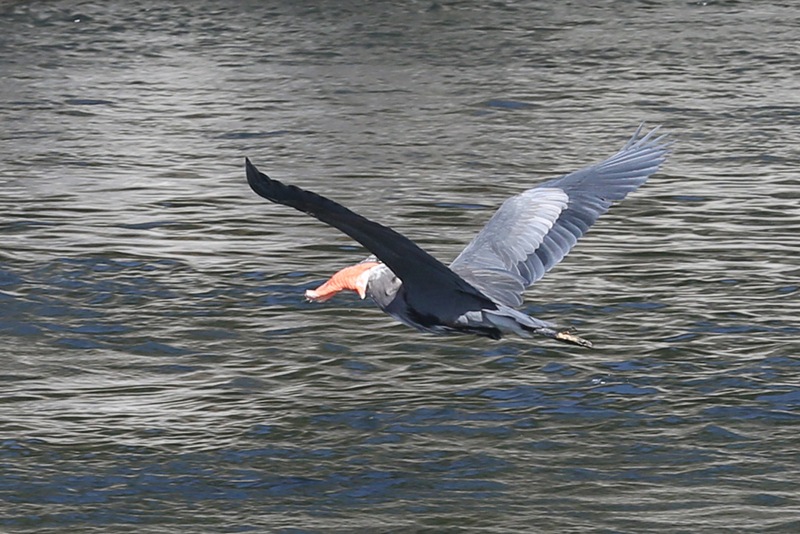 I wish I’d had my 400mm lens on the camera — but I didn’t. 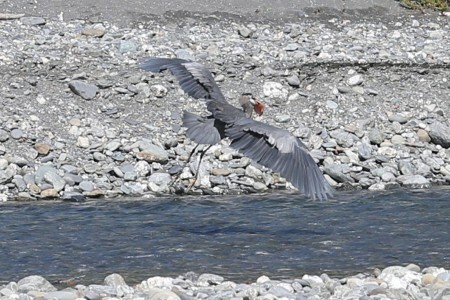 This entry was posted on Thursday, October 18th, 2012 at 6:25 pm	and is filed under Herons. You can follow any responses to this entry through the RSS 2.0 feed. Both comments and pings are currently closed.